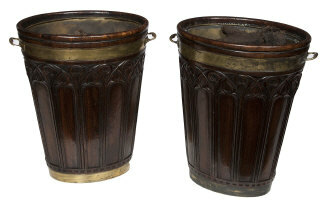 A pair of Gothic style carved peat buckets in the George III style (2,000-3,000). UPDATE: THESE WERE UNSOLD. An exceptional pair of serpentine shaped kingwood and marquetry fold over card tables, 19th century. (8,000-12,000) UPDATE: THESE SOLD FOR 8,000. 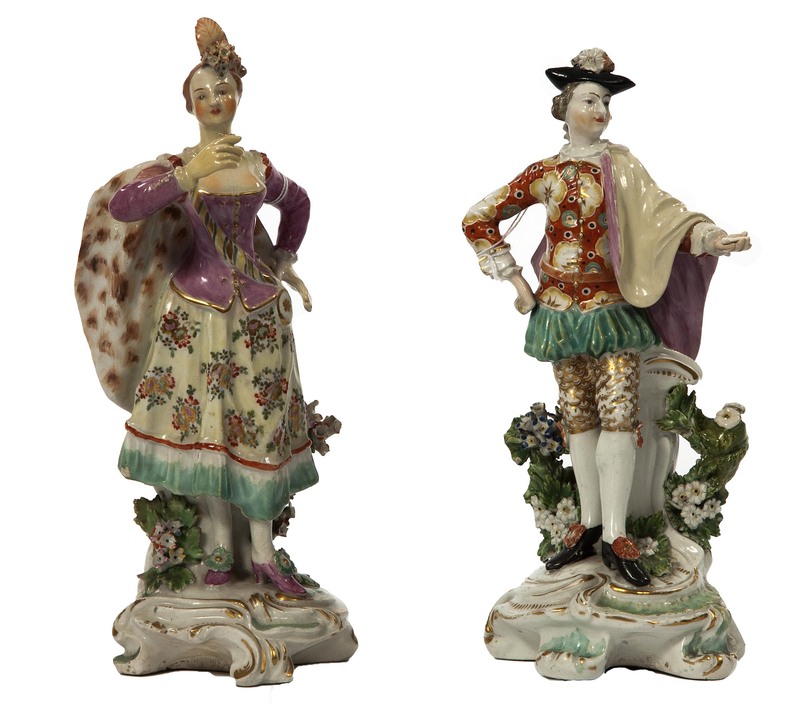 This pair of c1758-65 Derby Figures, The Ranelagh Dancers, was once in the collection of Sir John Gielgud. 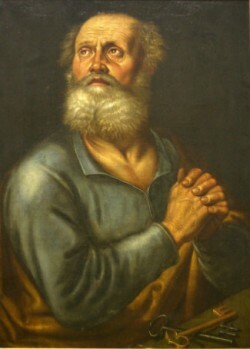 (300-500). UPDATE: THESE MADE 300. 12.04ct Fancy Intense Pink Type IIa Round Brilliant-Cut Diamond Ring, by Harry Winston Estimate: HK$65,000,000-95,000,000 US$8,000,000-10,000,000. Click on image to enlarge. Picture © Christie's Images Limited 2012. The largest round fancy intense pink diamond ever at auction features at Christie’s sale of magnificent jewels in Hong Kong on May 29. The 12.04 carat stone was purchased from Harry Winston in 1976, the year the US launched it first satellite on a mission to Mars. The stone was named the Martian Pink. 11.85ct D VVS1 Potential Round Brilliant-Cut Diamond Ring, by Harry Winston Estimate: HK$13,500,000-20,000,000 US$1,700,000-2,500,000 © Christie's Images Limited 2012. (Click to enlarge). It is one of only two known significantly sized round pink diamonds in the world. The 23.60 carat Williamson Pink was presented to Queen Elizabeth II on the occasion of her wedding in 1947. The Martian Pink shows no trace of secondary colour, making it very rare. 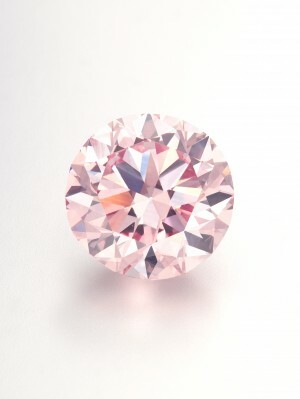 Most natural pink diamonds exhibited a colour modifier like purple, orange or grey. 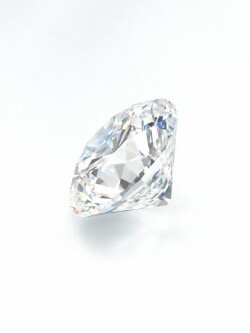 It is offered alongside an elegant 11.85-carat D VVS1 potentially flawless round brilliant-cut diamond of D colour. 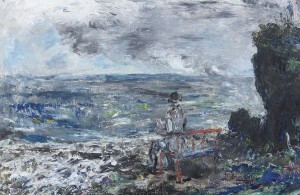 The Novelist by Jack b. Yeats sold for 95,000. (Click on image to enlarge). The Novelist by Jack B. Yeats sold for 95,000 after the James Adam Irish art sale in Dublin on March 28. 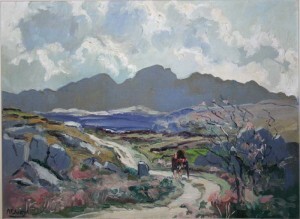 The 1944 painting, which had been estimated at 100,000-150, attracted keen interest but was bid to a figure short of the reserve. It was sold the following day. 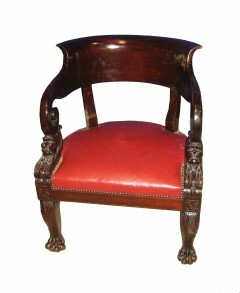 This brought the total for the auction of over 200 lots to just under 500,000. 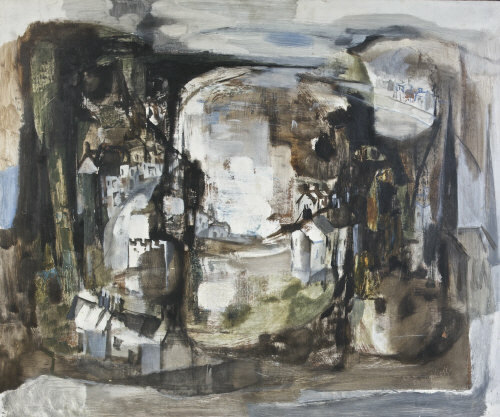 Memory of Clifden by George Campbell sold for 20,000. More than 70 per cent of the lots on offer were sold. The Novelist was in a number of international exhibitions including the Yeats centenary exhibition of 1971 organised by the National Gallery of Ireland shown in Dublin, Belfast and New York. 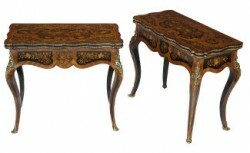 (See post on antiquesandartireland.com for March 21, 2012). 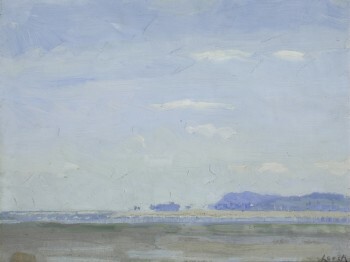 William John Leech (Irish, 1881-1968) Sutton Sands. (Click on image to enlarge). UPDATE: THIS MADE £8,750 INCLUDING PREMIUM. 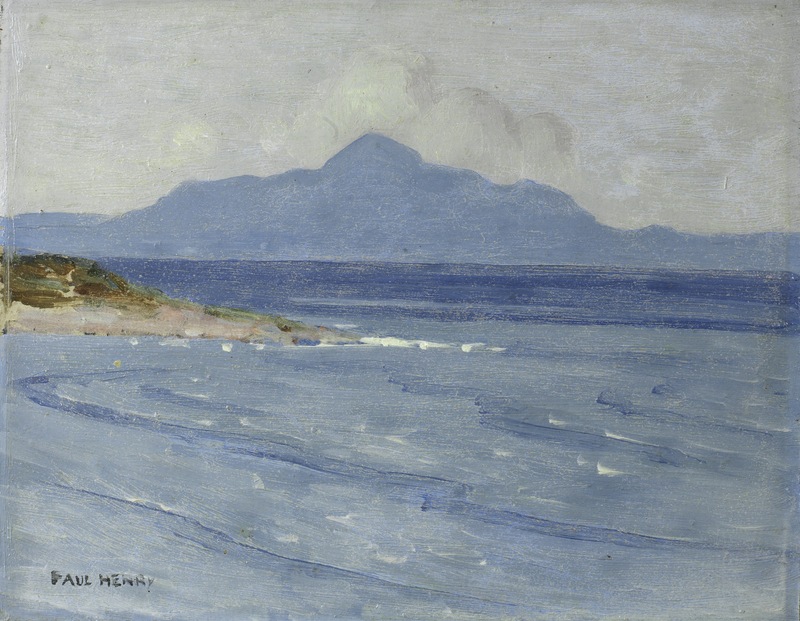 Paul Henry R.H.A. (Irish, 1876-1958) A view of Croagh Patrick from Achill Island. (Click on image to enlarge). UPDATE: THIS MADE £25,000 INCLUDING PREMIUM. 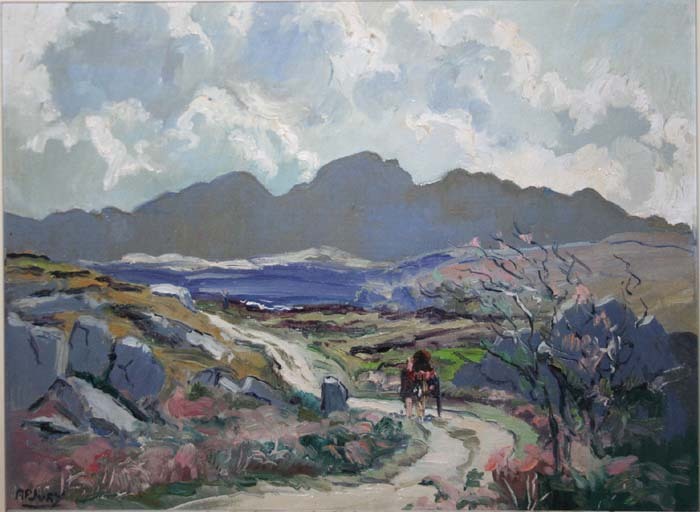 A view of Croagh Patrick from Achill Island by Paul Henry is one of the Irish highlights at Bonhams 20th Century British and Irish Art in London on May 30. Croagh Patrick in Co. Mayo is a renowned site of pilgrimage in honour of St. Patrick. Here the saint reputedly fasted for forty days before using the Black Bell to combat the birds and demons that challenged him, and in doing so banished all the snakes from Ireland. It is estimated at £10,000-15,000. The sale includes two works by Gerard Dillon, Little Boy Playing at God (painted in 1945-6 and estimated to sell for £30,000-50,000) and The Moon Over the Bog (painted in 1954 and estimated to sell for £50,000-70,000). 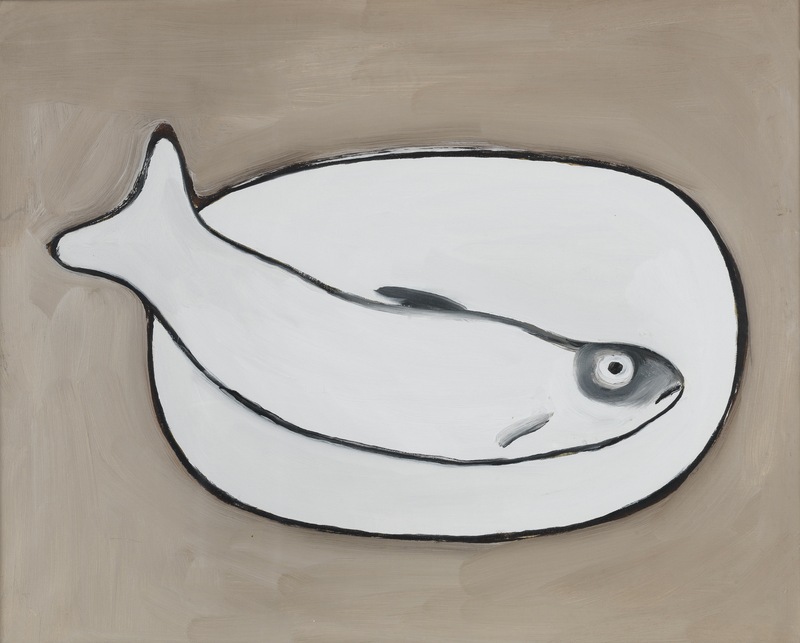 Other works in the sale include Fish by William Scott, initially sold to benefit the Royal Academy of Arts Trust, and estimated to sell for £60,000-80,000, Sir Gerald Festus Kelly’s Portrait of Jane with a white shawl XXVII, depicting the artist’s wife Lilian Ryan (£7,000-10,000), and Sutton Sands, a view of Sutton Beach at the northern edge of Dublin Bay painted by William John Leech in 1909 (estimated to sell for £7,000-10,000). 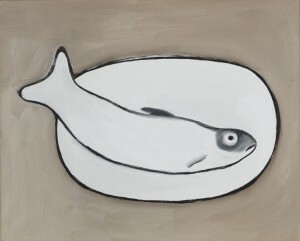 William Scott R.A. (British, 1913-1989) Fish (1982). (Click on image to enlarge). UPDATE: THIS MADE £61,250. Cézanne's card players watercolour. UPDATE: IT MADE $19,122,500. 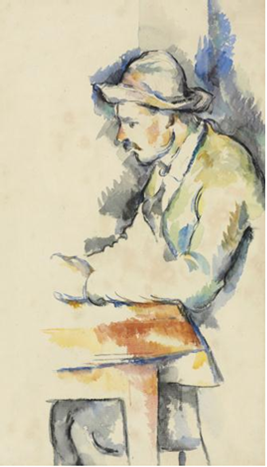 A Cézanne card players watercolour last seen in public in 1953 will highlight Christie’s Impressionist and Modern Art Evening Sale on May 1 in New York. 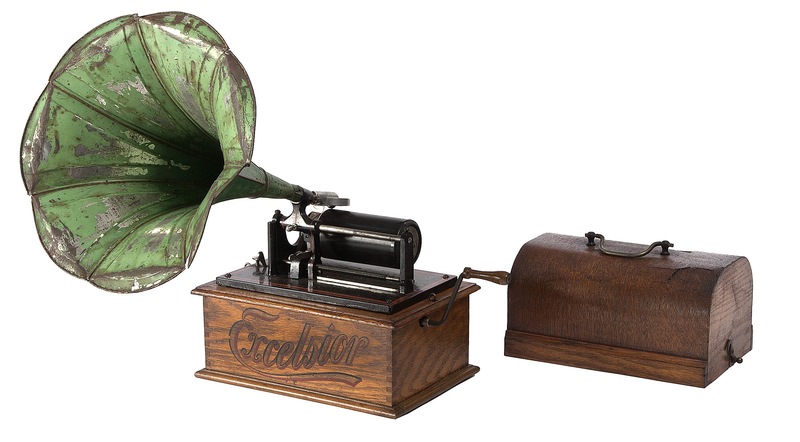 It has re-emerged from a private collection in Texas after nearly 60 years. The full sized work on paper is a preparatory study for Joueurs des cartes (Card Players), the seminal five-painting series that Cézanne completed between 1890 and 1896. Previously known only from a black and white photograph it was rediscovered in the collection of the late Dr. Heinz F. Eichenwald, a collector and medical expert who spent his career in Dallas after emigrating to the US in the mid-1930s. 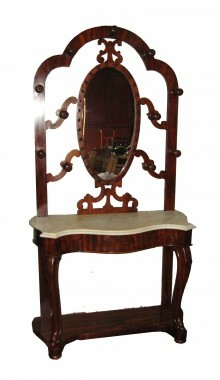 Meticulously preserved it is estimated to achieve US$15–20 million. UPDATE: THIS WAS BOUGHT FOR OVER $19,122,500 MILLION BY AN ANONYMOUS PURCHASER. See post on antiquesandartireland.com for February 4, 2012. AHMED ALSOUDANI (Iraqi, b. 1975) Untitled at Christie's, Dubai. It was executed in 2008. (Click on image to enlarge). CHRISTIE'S IMAGES LTD. 2012 UPDATE: THIS MADE $386,500. 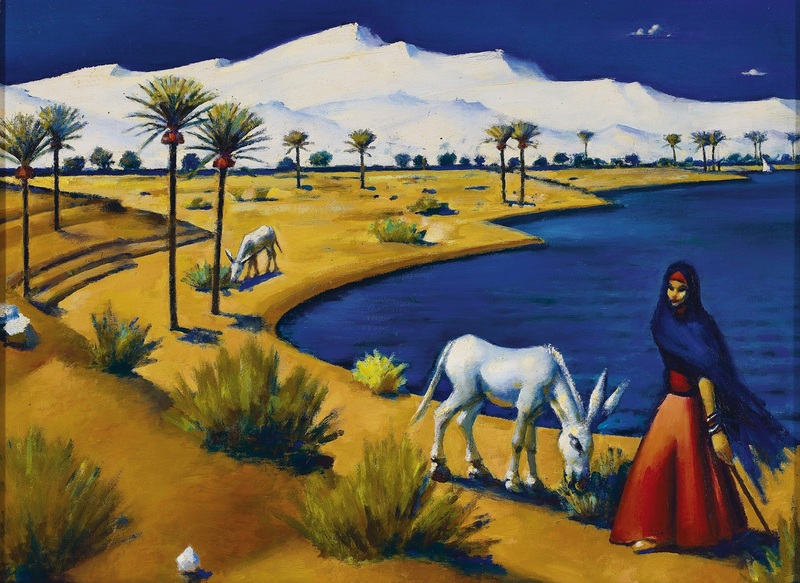 THE earliest example of contemporary Iraqi artist Ahmed Alsoudani including a dictator figure in his work is a feature lot at Christie’s April sales of modern and contemporary Arab, Iranian and Turkish art in Dubai on April 17 and 18. The striking highly coloured image of a disfigured face surrounded by shattered forms was painted in 2008. It is estimated at $300,000-500,000. 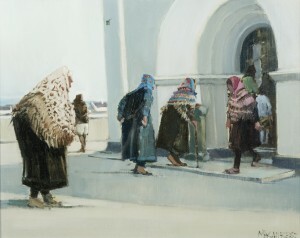 Last October in London there was a new world record for Alsoudani when his Baghdad I sold for $1.1 million at Christie’s. 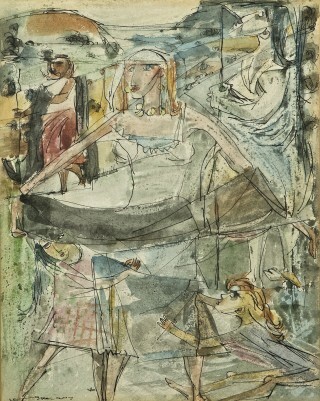 Mahmoud Saïd (Egyptian, 1897-1964) Marsa Matrouh - Vers le bain de Cleopatre at Christie's Dubai. (Click on image to enlarge). 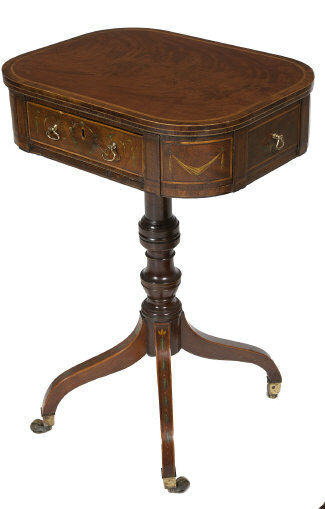 CHRISTIE'S IMAGES LTD. 2012 UPDATE: THIS MADE $602,500. 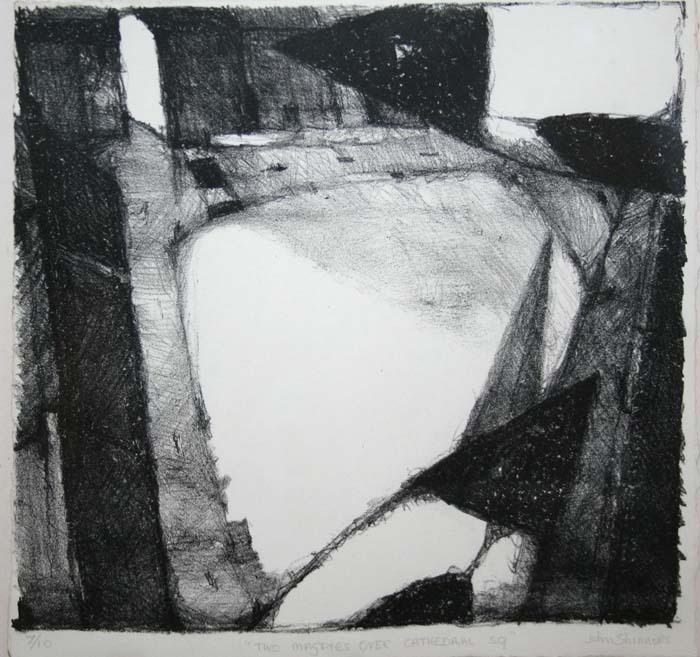 There are two key works by Mahmoud Saïd, the father of modern Egyptian art. His view of a woman and donkeys beside the Nile with a mountain range beyond is estimated at $250,000-300,000. 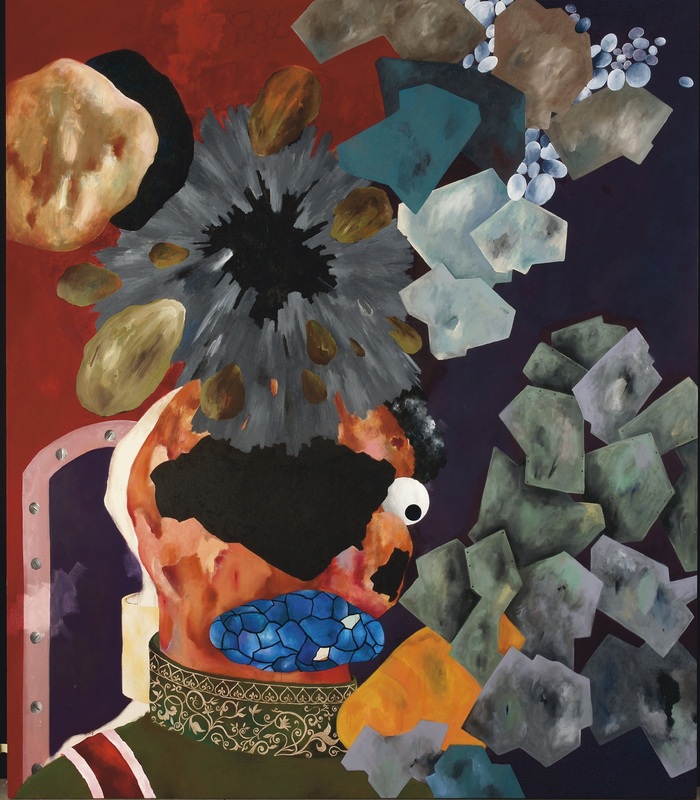 Other highlights include pieces by Ayman Baalbaki, Jewad Selim, Louay Kayyali, Mohammad Ehsai, Parviz Tanavoli and Nasrollah Afjehei and the Turkish artists Burhan Cahit Do?ançay and Azade Köker. 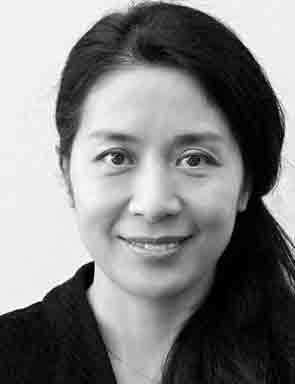 Last week Art Dubai, the Gulf fair for contemporary art from the Middle East, North Africa and South East Asia, recorded high volumes of sales from what is still a young market. 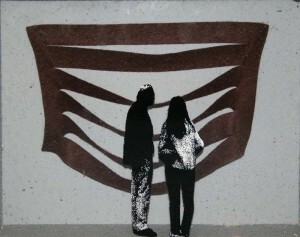 In 2012, Art Dubai welcomed 22,500 visitors, including 75 international museums groups. UPDATE: Christie’s April sales of Modern and Contemporary Arab, Iranian and Turkish Art totaled $6,402,825 / AED23,515,190 against a pre-sale high estimate of $6.1 million. The sales were 93% sold by value. 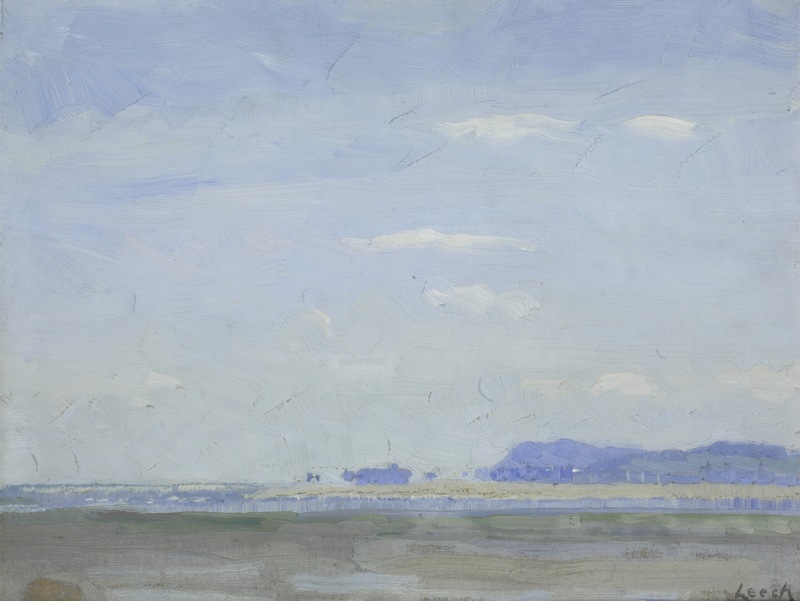 Jack B. Yeats, Paul Henry and Louis le Brocquy all feature at the James Adam sale of important Irish art in Dublin on March 28. A watercolor by Louis le Brocquy from his acclaimed Tinker series shown at the Arts Council of Great Britain’s “Thirty Contemporary Paintings” exhibition is estimated at 15,000-20,000. 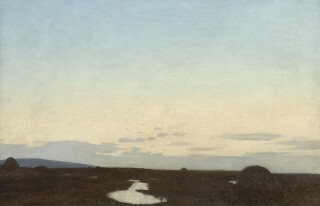 Paul Henry’s Sunset on Connemara Bog, from the collection of his friend and supporter John Louden of Belfast, is believed to have never been exhibited in public before. 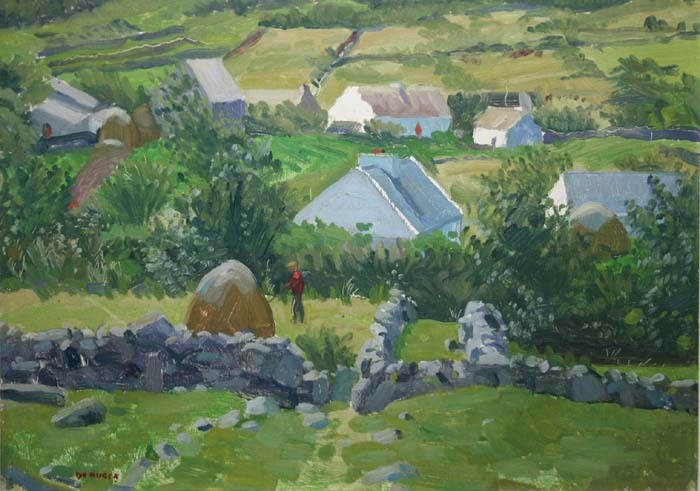 The Novelist by Yeats is estimated at 100,000-150,000 and a 1909 Yeats entitled Downpatrick Head, Co. Mayo is estimated at 25,000-35,000. 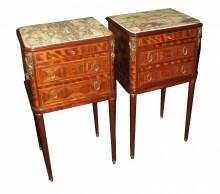 The catalogue, which is on-line, lists 226 lots. Here are a few of them (click on any image to enlarge): UPDATE: The Novelist sold for 95,000. 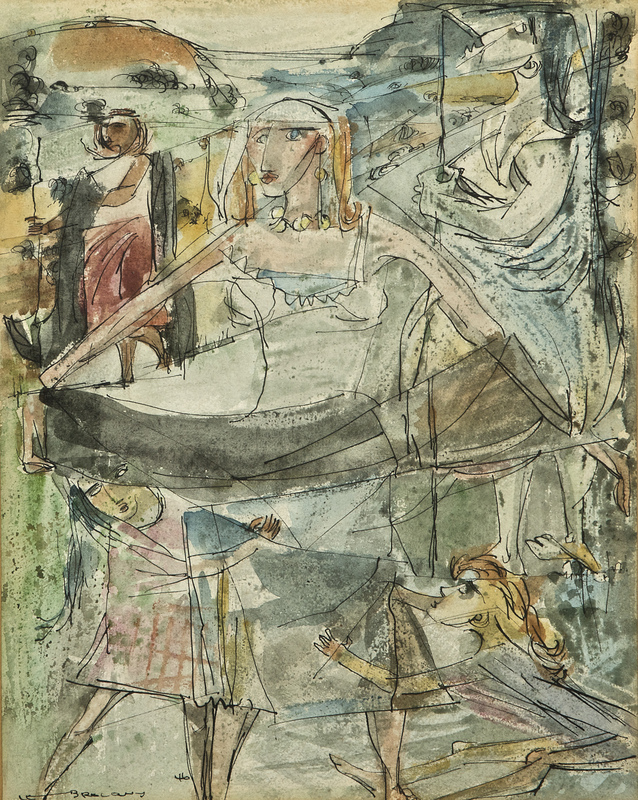 LOUIS LE BROCQUY HRHA (b.1916) Tinker Women (1946) watercolour signed and dated ‘46 (15,000-20,000). UPDATE: THS MADE 27,000. 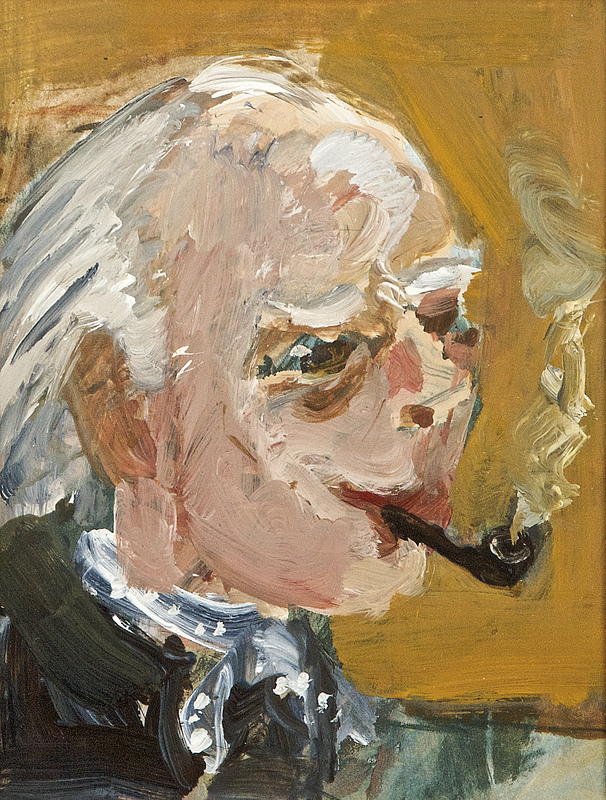 BASIL BLACKSHAW RHA RUA (b 1932) Self Portrait (Given by the artist to gallery owner Tom Caldwell on his 80th birthday in 2001) (3,000-5,000). UPDATE: THIS MADE 5,200. CECIL MAGUIRE RHA RUA (b.1930) Going to Church, Aran (From the estate of photographer Bill Doyle) (2,000-3,000). UPDATE: THIS MADE 5,600. 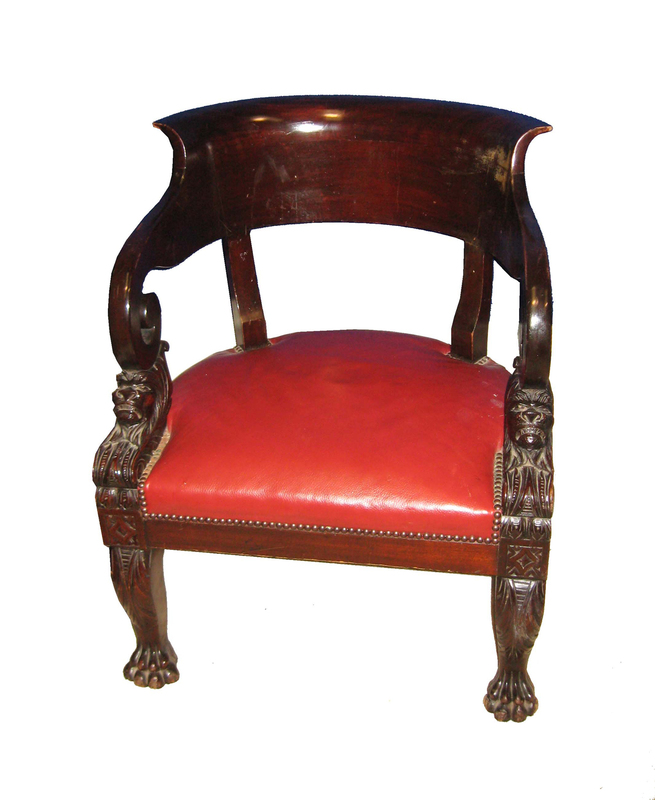 One of a pair of Irish William IV library chairs estimated at 4,000-6,000. 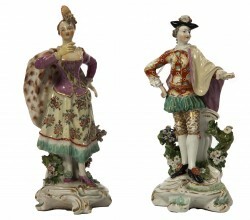 UPDATE: THESE WERE UNSOLD BUT ARE UNDER NEGOTIATION AT AROUND 3,000. A Victorian mahogany hallstand with mirror and marble top is estimated at 1,000-2,000. UPDATE: THIS SOLD FOR 1,400. This pair of French bedside lockers is estimated at 600-900. UPDATE: THESE MADE 900.